Last week when I made the Chicken Casserole I set out to demonstrate a use for my homemade chicken stock. Tonight when I rustled up one of my favorite quick dinners I realized that I was using the second of three large chicken breasts that came in a package my wife bought. The thought occurred to me that it was a great way to demonstrate getting a real value for your food dollar. Kat picked up a package of boneless chicken breasts at Aldi last week. There were 3 large breast halves in the package weighing in at 2.43 pounds (or about ¾ pounds each) for $6.05. If I could use each of the 3 breasts for the basis for 3 different dinners for two that’s just over a dollar per plate! Sure I use other ingredients in the preparation but the protein is often the most expensive element of a meal. When you’re on a budget and trying to stretch your dinner dollars…a buck a person is an awesome start! So once again I find myself posting a less than glamorous recipe but hey it’s Monday night after a tough day at work, after the NFL playoffs yesterday. I didn’t feel like spending all night in the kitchen and yes, at the risk of sounding silly I’ll say it again; this too is a Recipe Randy Cooks. It also happens to be one of my favorite ways to use boneless, skinless, chicken breasts. Because I was using an extra-large chicken breast half I was able to get 4 nice pieces out of one breast by first butterflying it, then dividing it into 4 equal pieces. Here is a video that shows how to butterfly a chicken breast: http://www.youtube.com/watch?v=ySB2jgO1ljU&feature=fvw . For this recipe the breasts should be pounded very thin, no thicker than ¼ inch at the very thickest part. Note that I dump out the oil and wipe the pan after cooking each batch of chicken. This is my secret method of ensuring a perfectly and evenly browned cutlet every time. Oh, and lest I forget… Brianna’s Real French Vinaigrette is my favorite salad dressing and it’s a perfect choice in this dish. 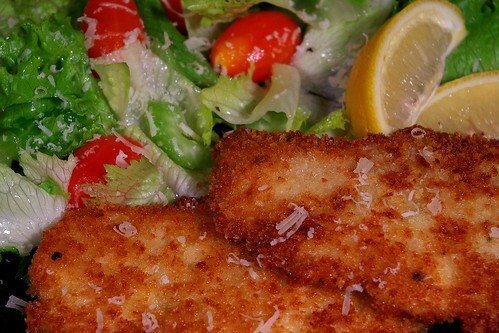 Traditionally the cutlet is buried under the salad but Kat and I both prefer it alongside so the chicken stays nice and crispy even after drizzling on a little fresh lemon juice. 1 – Large Skinless Boneless Chicken Breast, butterflied and divided into 4 pieces, then pounded to ¼ thickness or less. Salad of Green Leaf Lettuce with Grape Tomatoes and Celery slices. In one bowl, season the flour well with salt and pepper and stir to blend. In another bowl, gently beat the eggs and water to combine. Place the Panko Crumbs in a third bowl. One at a time dredge the chicken pieces first in the flour, shaking off any excess, then in the egg, then finally in the Panko Crumbs to coat evenly. Place the chicken in a single layer on a foil or parchment lined sheet pan to rest at room temperature for 20 minutes before cooking. Warm two tablespoons of oil in a large non-stick pan over medium heat. When the oil is shimmering hot cook two pieces of the chicken, turning only once, until “light” golden brown on each side. Move the cooked chicken to a paper towel to wick away any excess oil and season lightly with salt and pepper. Discard any oil left in the pan and carefully wipe out the pan with a paper towel, then add 2 more tablespoons of oil and repeat the process, cooking the other two chicken pieces. To serve, toss the salad, tomatoes, and celery with the dressing being careful to use only enough dressing to coat the greens. Place the chicken on the plate and cover partly (or not) with the salad. Top with shaved Parmesan and garnish with lemon slices to finish. This recipe is an adaptation of Ina Garten’s Turkey Meatloaf recipe, which you will find at http://www.foodnetwork.com/recipes/ina-garten/turkey-meatloaf-recipe/index.html. 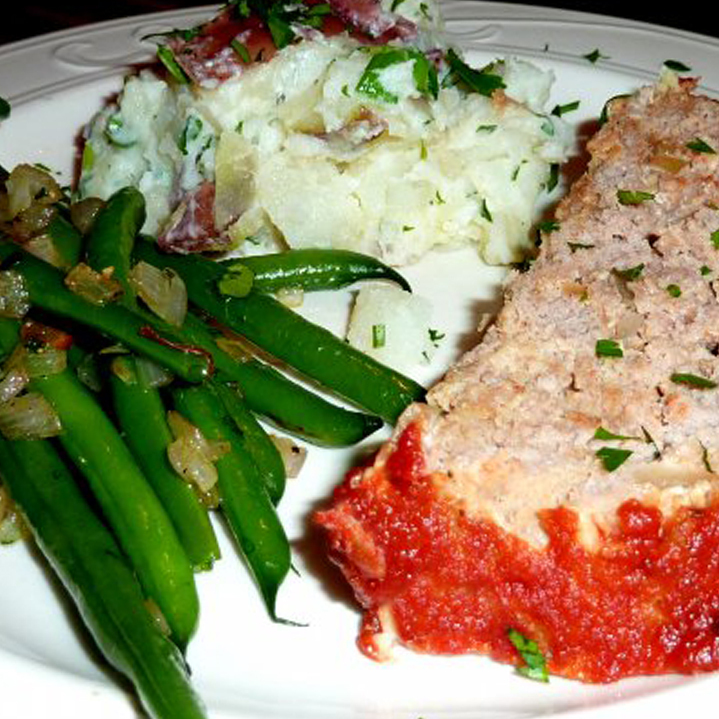 Her recipe is one of my favorite turkey meatloaf recipes and makes enough for a crowd! The version below cuts down on the size by half and boosts the flavor by adding an Italian flair. Believe it or not I originally came up with this version because the turkey italian sausages at Publix were nearly $2.00 a pound cheaper than the packaged ground turkey. In this recipe I can’t stress enough to “Coat the Meat Loaf very generously all over with kosher salt, ground black pepper, and Italian spices”! This really does boost the flavor and forms such a great crust that I am tempted to nibble all the way around the outside of my leftover meatloaf sandwiches just like when I was a kid. In a sauté pan, over medium low heat, cook the onions, olive oil, salt, pepper, thyme and bay leaf until the onions are translucent (but not brown) approximately 15 minutes. Add the Worcestershire, broth, and tomato paste and stir until mixed well. Simmer until just heated through then remove from heat and allow the mixture to cool. Remove and discard the thyme sprigs and bay leaf. Line a sheet pan with foil then set a foil wrapped cooling rack on the cookie sheet. Using a toothpick or a skewer poke drain holes in the foil on the cooling rack. These should be spaced roughly one drain hole every inch or so. Place the meat loaf in the oven and bake for one hour. (Note: If you place a pan of hot water on the shelf below the meat loaf this will keep your loaf from splitting.) Meanwhile, combine the ketchup, coriander, hot pepper sauce, and vinegar in a small sauce pan over medium low heat. Stir until well mixed and heated through. When meat loaf has cooked one hour, carefully remove it from the oven and coat evenly with the ketchup glaze. Return the meat loaf to the oven and bake 30 minutes more. Allow the meat loaf to rest 15 minutes before slicing.